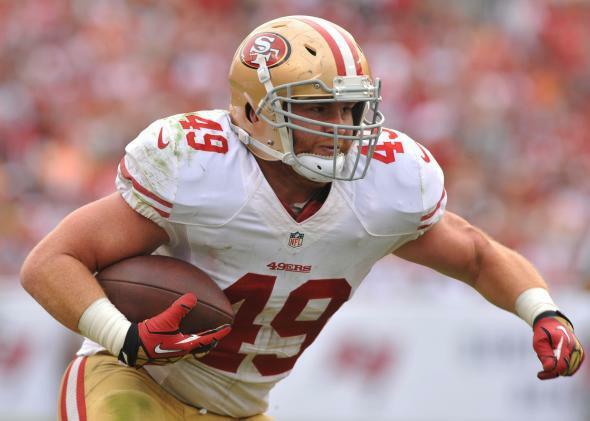 Bruce Miller, 49ers fullback, arrested for domestic violence: Will NFL policies work? Fullback Bruce Miller Arrested for Domestic Violence. How Will the NFL and 49ers Respond? Bruce Miller of the San Francisco 49ers was arrested on Thursday for domestic violence. In the midst of the controversy last year, several teams took decisive action. The 49ers already let another player, Ray McDonald, go in December after sexual assault allegations were leveled against him. The charges have since been dropped, and McDonald is now a free agent. Carolina Panthers defensive end Greg Hardy sat out most of last season because of domestic violence accusations and was formally released by the Panthers to become a free agent this week. The charges against Hardy were also dropped, and it’s still up in the air whether the NFL will suspend him, but teams like the Atlanta Falcons are already hastily denying any intention of picking him up as a player. Miller’s arrest, however, comes during the off-season, with much less media attention on the NFL. How the 49ers act when not as many eyes are watching matters a lot. When announcing the new policies in December, the NFL created a flowchart to explain how they work. Basically, the NFL will conduct an independent investigation, working with law enforcement but not interfering with law enforcement. “An individual is subject to discipline under the policy if the person is determined to be guilty of a criminal charge or if the NFL investigation demonstrates the person engaged in conduct prohibited by the policy,” the flowchart explains. The real question is what that investigation process is going to look like. When it comes to domestic violence, it’s often hard to make charges stick because victims refuse to testify, often out of some combination of fear, loyalty to the abuser, and desire to make the entire situation just go away. In fact, the victim’s refusal to cooperate is the reason that North Carolina prosecutors are dropping charges against Hardy. But, as Hardy’s situation shows, the NFL is not bound by the same rules that lawyers for a legal prosecution must follow. Even when there is not enough evidence for a criminal conviction, the NFL can decide on its own that there’s enough evidence to find a player guilty of violating its code of conduct. If the NFL finds that there was any physical violence, it should not hesitate to punish Miller. The coach of the 49ers, Jim Harbaugh, has gone on the record claiming the team has “no tolerance” for domestic violence, but, as my colleague Jeremy Stahl reported in September, there were four players with such charges playing on the team when he made that statement. Since then, they’ve let McDonald go. How seriously they will take this problem now that the heat is off, however, remains to be seen.